Next in order of discussion comes the lift known as "the jerk." In this lift, with the bell held at the height of the shoulders, the lifter (as in Fig. 67), while keeping his body erect, bends the legs slowly at the knees, and as he suddenly straightens them he simultaneously shoots his hand aloft. This motion will carry the bell to about level with the crown of the head, and then it loses its momentum. At that exact instant you must again bend the knees and squat under the bell, just as in Fig. 29. you will notice that this is exactly the position as one of the leg exercises. When a beginner starts to practice the "jerk," either with one hand or two hands, he is possessed with the idea that the first motion should carry the bell all the way to arms' length. So he will make a tremendous effort, which will carry the bell about 5 inches above the head, and then he will stand with the legs almost straight, and try to force the bell up the rest of the way by pure arm strength. You will probably do just that when you start to practice it, and if you do you must stop at once and learn the correct way. If you can master the second dip with the knees, your record will be 50 to 100 lbs. better than if you attempt to force the bell up entirely by arm strength. The second dip with the knees is the most important part in the whole lift. Some lifters perform a sort of split in order to lower the body; that is, they spring forward with one foot and backward with the other. Others step forward with one foot, and still others step backward with one foot. That is all lost motion. The correct thing is to drop the body straight downwards by sitting on the heels, which is the style used by Steinborn. 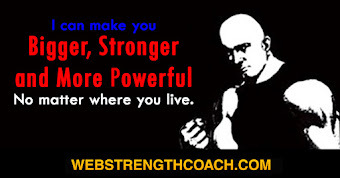 In making a right-arm jerk some lifters bend the body slightly to the left and allow the right arm to rest on the right side of the body, as in Fig. 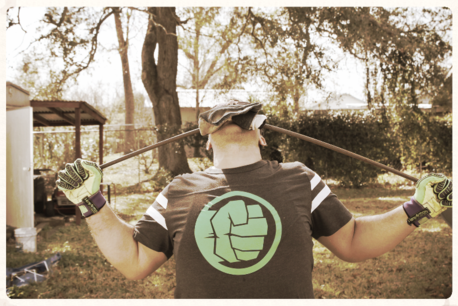 68. in a two-arm jerk some lifters allow the handle bar to rest on the upper chest, as in Fig. 67, and jerk the bell off the body. Geo. Jowett holds the bell almost opposite his chin and extends the elbows out to the front. That is an extremely scientific method, because before Jowett has started to raise the bell overhead, his elbows are half way up; whereas if a man holds his elbows down by his sides, as in Fig. 67, they have to travel twice as far as Jowett's doe before the arms are straightened. But Mr. Jowett has a tremendous wrist and very thick forearms, and I doubt whether his style would be possible for everyone. 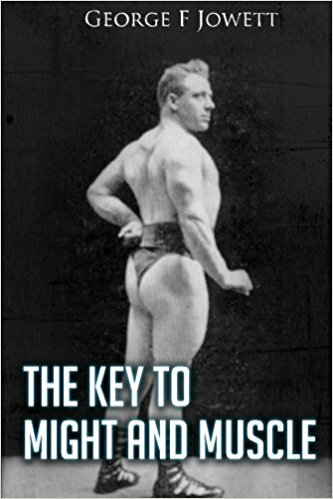 However, it is interesting to know that Jowett at the weight of 158 lbs., and using his style, raised 286 lbs. in the two-arm jerk; whereas Steinborn, using the other style, raised 345 officially, and 375 unofficially, and Steinborn weighed 215 lbs. Since Jowett came closer than Steinborn to raising double his own weight, his style seems to be justified. 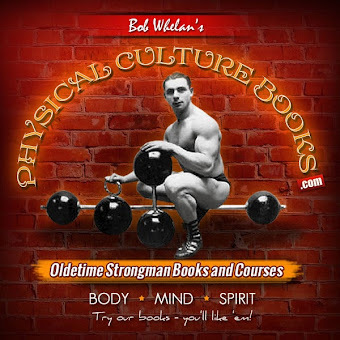 If you were reading a lifting-record book you would be very much confused by the multiplicity of records, unless you were posted regarding the styles used in different countries. In England and France the rules require that a lifter must raise the bell clean from the floor to shoulder before jerking it aloft. In fact, I believe that they still enforce that rule. The word "clean" signifies that the bell must be lifted in one motion to the chest without touching the body on its upward journey. In Germany and Austria the lifter was allowed to get the bell to the shoulders in any way that he pleased. If he were going to make a one-arm jerk he was permitted to take the bell in two hands and, with a mighty swing, bring it from the floor to in front of his right shoulder. Then he would let go with his left hand and make the jerk with the right arm. 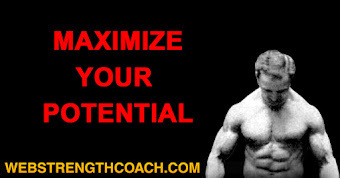 An English or French lifter would be disqualified if he did that. He was compelled to lift the bell with one hand all the way, and to use only his right arm in raising the bell to the shoulder, as well as in jerking it from the shoulder to overhead. In the two-arm jerk the French and English lifters raised the bell clean; but in Germany, Austria, and all the other European countries, the lifter could raise the bell from the floor, rest it on his abdomen, as in Fig. 71, then give a jump, get it across the lower part of his chest, and then with another jump get it opposite his neck and ready to jerk aloft. (Sometimes the rules were so lax that the lifter was allowed to wear a belt with a huge buckle in front. He would raise the bell and rest it on this buckle; then he would lean back from the waist and roll the bell up the front of his body. This is an easy trick for a stout man.) When you compare the foreign records you must take into consider the method used. The French record is something like 345 lbs. 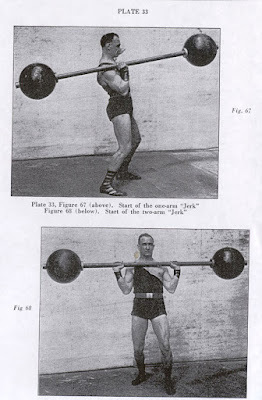 ; whereas, the Austrian record is almost 80 lbs. more. 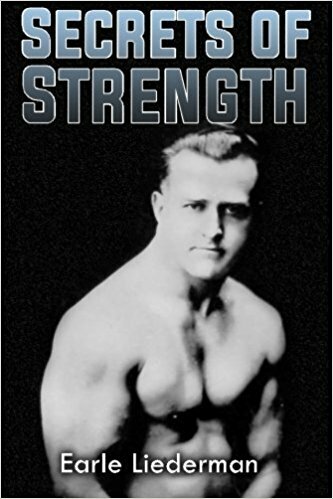 That record stood for years until Henry Steinborn, in Philadelphia, did 347-3/4 pounds under official conditions. 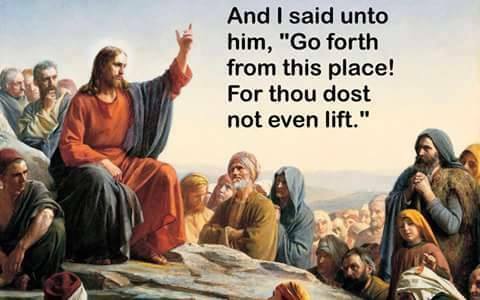 Then, a week later, he did 375 lbs. unofficially. He thought he was lifting 350, but the men who loaded the bell made a miscalculation, and the bell actually weighed 375. 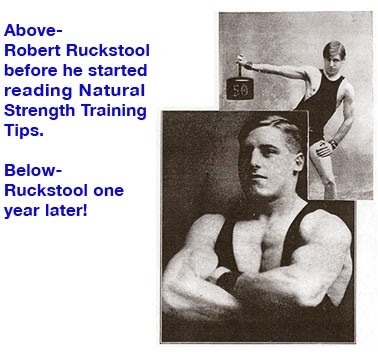 Steinborn failed in his first two attempts and got it up on his third attempt, because he knew in his heart and soul that he could do 350. when they weighed the bell and they found that he had done 375, he could hardly believe the news. 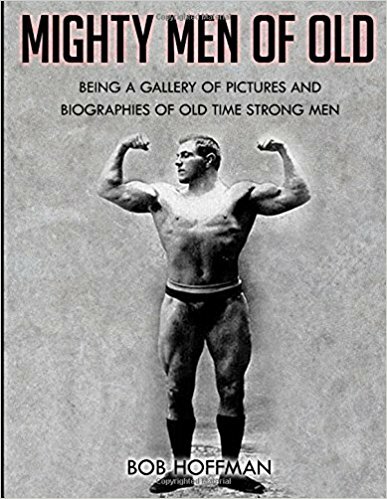 Before the War, I used to subscribe to French, English and German magazines which were devoted to lifting, and even then the German lifters sneered at the smallness of the French records, and the French in their turn sneered at what they called "the German's clumsy and unfair style." The only way in which I am interested in the controversy is in its relation to super strength.